Wondering how to create a warm and welcoming dining room that makes every meal feel like a special occasion? Most people start with their dining table, of course, but the other elements play a very important role in creating an inviting room. By looking at your dining room with a fresh eye, you can design a space that’s equal parts comfortable, functional and beautiful. 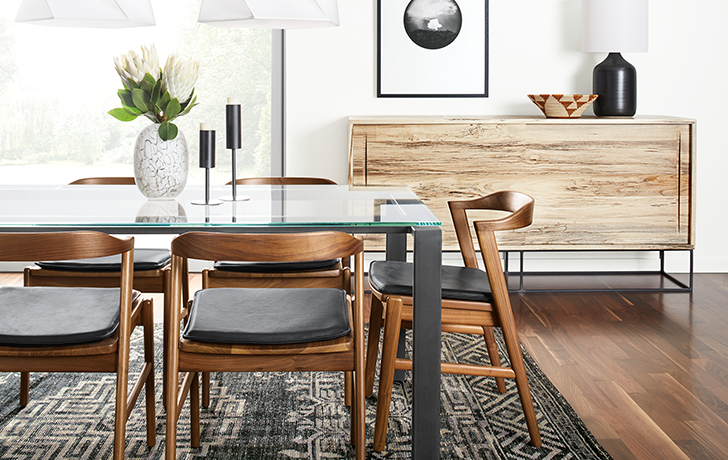 Get ready for guests with these tips and ideas for an inspirational dining room. Pendant lighting puts the focus where it belongs: on a delicious meal and on your dinner companions. 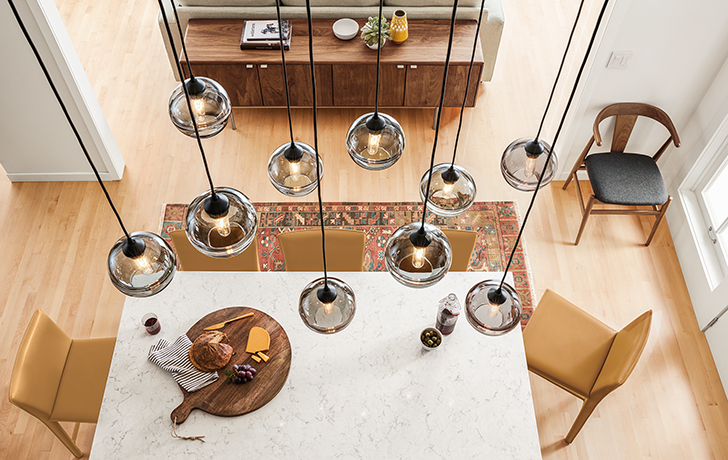 Choose a pendant lamp that’s large enough to light up the entire table, or group multiple small pendants, so none of your guests end up dining in the dark. A good rule of thumb is to position the bottom of the pendant shade 30 inches above the table. Add instant ambiance with the soft lighting of table lamps. Placed on nearby storage pieces, table lamps add further warmth and intimacy to your dining experience. Place a colorful rug beneath your dining furniture to add a little spice to your space. In general, you want to choose a rug that’s large enough so guests can push back their chairs without sliding off the rug. Custom rugs can be made to your measurements for the perfect fit. And don’t fret about occasional drips and spills. 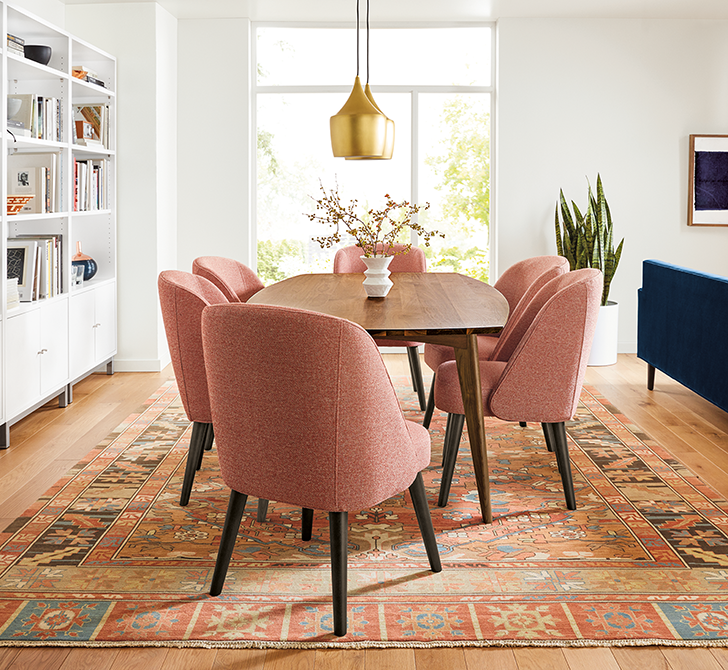 Wool rugs are naturally stain resistant, so clean up is easier than you think (though the kids’ table might need some additional protection underneath). Benches placed along one side of a table can save space and put a new spin on classic dining. Cozy and casual, benches also tuck under the table and out of the way when not in use. Depending on the type you choose and how many people you need to seat, benches may also provide a money-saving alternative to chair-only seating arrangements, since you may be able to fit more people at the table. Or use traditional dining chairs in fresh combinations to serve up a bit of personality. Cover several of the same chair silhouettes with a variety of complementary fabrics for an eclectic, modern look. Or choose different silhouettes in the same wood type for a subtle juxtaposition of style elements. Let dining room storage pull double duty as a place to stow files, games and books. Or line a wall with bookcases to transform the space into a cozy, eat-in study. When using a more traditional buffet or console, choose a height that’s a bit taller or shorter than your dining table to create more visual interest. You can also use the top of the cabinet as a serving area for entertaining or a place to display dishes. For spaces with unique needs year-round, you can create exactly what you want with our Custom Storage cabinets. Combine file drawers, wine racks, display shelves and more into the perfect storage setup for your home.